The master tattoo artist recalls his favorite musical ink, including Sigur Ros, Hayley Williams, New Found Glory and more. I am, and have always been, a person fascinated by tattoos. The decision to permanently ink a piece of artwork onto your skin has always felt so significant to me, so primal, in a way. I wanted one since I was small, and my mom made a deal with me: “wait until you are eighteen, and I’ll pay for it on your birthday.” And I held her to it. We wandered downtown together to MacDougal street, where I presented the artist with a sketch I’d drawn of a butterfly and asked him to place it on my shoulder while I leaned over the chair clutching a ginger ale and wincing. Yes, yes, I know: a butterfly. I was still a girl, I guess. Nearly a decade later I had the ludicrously talented Amanda Wachob cover it with one of her masterpieces, which you can see a shot of here. It took me some years to understand that a tattoo was not just about preserving something with meaning, but also seizing the opportunity to carry a hint of artistry, of beauty, with you at all times. People often tell me that the reason they haven’t gotten a tattoo is because they can’t think of anything “meaningful” enough. While most of my pieces have some degree of importance to me, I’ve long argued that beauty is simply enough. Pick something you think is truly beautiful, done by a true artist, and you’ll never regret it. Beauty is truth, and if you go with beauty, it will never ring false, old, tired. Ian White is one of those artists. I’d heard of his work when I arrived here from various friends, and first saw one of his pieces on the arm of photographer Allister Ann, whom I’d met at an Imogene + Willie Supper & Song. It wasn’t big, but it struck me in its delicacy, its sheer, effortless beauty, resting on her arm like a wisp. I later wrote about Ian for the Nashville Scene’s Best of Nashville issue, and had the pleasure of spending some time with him at his Edgehill Village shop. He calls his style “implied realism,” and I couldn’t think of better phrasing myself. Perhaps part of the reason I’ve always loved tattoos is because, to some degree, they go hand in hand with music. As a child I first saw them on the arms of my favorite rock stars, and grew to make a strong connection between these two loves. They not only looked beautiful but signified a commitment to that artistic side of yourself, on your sleeve (literally) or hidden away for you alone. So I thought it would be a perfect opportunity to have Ian recount to us his favorite musical tattoo moments in a special Nashville Five. Make sure to check out the slideshow to see larger photos of each work. You can find Ian here, at his shop, Safe House Tattoo. It’s funny being drawn into a city such as Nashville. A place which has a heart beat. A distinct one at that. The best part to me is that the rhythm of it varies. Although it’s still the same blood flowing through it. A viscous, red that compiles of donors from all over the world. Like Steve Austin (the 6 million dollar man, not the wrestler) this town bounds due to it’s composition of many from everywhere. I had been to Nashville many times before to attend the Full Moon Tattoo Convention. Every visit was a great time, although I had never really left the convention building to really go see Nashville. In 2009 I had decided to leave Ohio and hit the road to see where would be a suitable place for me to call home next. With plans in place to travel the entire United States over a years time, I made it 5 hours down the road and the trip was halted. After one week of a guest spot at Black 13 Tattoo Parlour, I was sold. This is home. I literally could’t explain it, but I knew it was it. What i had missed before wasn’t “seeing” Nashville, but to experience Nashville. 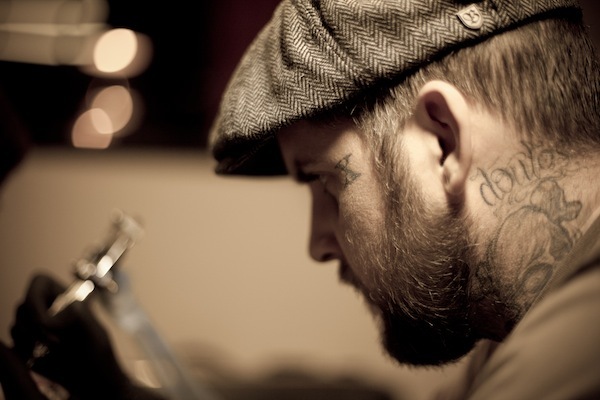 My move, and initial connections, to Nashville can be traced to my encounters with tattooing musicians on the road. That brings me to my Top 5. The top five musical artists that come to mind when I recall the past years of having them in my chair. 1. I have to start with Georg and Kjartan Holm from Sigur Ros. They are my number one partially due to my own incredible love for their music. They also come to mind because of their incredible hospitality and appreciation for my traveling to tattoo them. My wife and i were flown to Los Angeles on fairly short notice, and put up in their hotel. Georg went out of his way to make sure we were taken care of, and that we were able to see their show at Holly Wood Forever Cemetary. Although my wife and I felt a tad out of place at the afterparty, Georg and Kjartan did their best to make sure we had anything we needed. Georg even interrupted a conversation he was having with director Cameron Crowe to make sure he gave us a proper goodbye. It was a memorable experience. My wife and I will actually be flying to LA once again in April to go tattoo them again. This time even more members. The beauty of their music is made even better to me by the beauty of their kindness. 2. New Found Glory would be a good second for many reasons. I’ve been a fan since their first album, many many years ago. I went on tour with Bayside while they were on tour with New Found Glory. Day one, Jordan Pundik and I became friends. His desire, and longing to learn how to tattoo bound us together for what now proves itself to be a potentially life long tie. Although most of my excitement with tattooing them came from my love of their music, the relationship that grew from hanging with Jordan so much is what i’ll always remember. It grew to a point that he and his family moved to Nashville so that he could do a proper apprenticeship with me. It has been great, and he is a natural. At times it does strike me as funny that years ago i would have been asking him for his autograph, and now, he is my student. Strange how life rolls. 3. Number 3 would be Hayley Williams from Paramore. The funny party with my tattoo history with her is that the first time I was suppose to tattoo her, I actually talked her out of it. My friend Graham Howell was her head of security for a while. He got me set up to tattoo her when they were on your with Jimmy Eat World back in 2008, I think. She wanted some song lyrics on her wrist, and had given about a days time of thought put into it. I told her she should wait. A couple years later, I move to Nashville. Hayley was living here until fairly recently. Since my move, she has been in my chair for numerous tattoos. She had been amazing about spreading the word and sending people my way as well. Admittedly it was pretty cool seeing a tattoo that I’ve done, running around stage at the Grammy’s. She’s a talented gal, in a talented band. Great people, great music. 4. Stephen Christian, the lead singer for Anberlin, would be amongst my top 5 as well. I first tattooed him back in 2008. Then after moving to Nashville, I end up attending the same church as him and his wife for a bit. Stephen is a gracious man, who’s talent still boggles my mind. Since our first encounter, i have done a few other pieces on him, and have become friends. He is on the road quite a bit, but the occasional hangs, and New Orleans Saints games are always a great time to be had for both our families. 5. I have to include a local favorite that might not be as recognizable. The Rough And Tumble is a local duo that hooked both myself and my wife in. In Nashville you get invited to go watch many, many bands play at various venues. After many tattoo sessions on singer, multiple instrument playing, Mallory Graham, my wife and I attended a show and were blown away. We even were asked to be the sole subjects of a valentines day music video that they made. Quite an honor.